No matter whether it concerns the production of shower gel, paints, ketchup or jam - viscosity measurement is a practical parameter for checking quality in product control. Up to now, there have been either expensive and complex high-end measuring instruments on the market or inexpensive counterparts with massive restrictions in comfort and performance. The new rotational viscosimeter ViscoQCTM 100 from Anton Paar, available in three versions, squares the circle and offers unique functions in a chic design. "The most sensitive L-version covers a measuring range from 1 mPa·s (Milli-Pascal-Second) to 6000 Pa·s and is suitable for measuring juices or shower gels," explains product specialist Tamara Kurzmann. With the R-unit for medium viscosities from 10 mPa·s to 40,000 Pa·s, for example, it is possible to determine whether paints and coatings are ideally mixed, or more additives are required. High dynamic viscosities of chocolate or balms are identified with the H-version with a measuring range from 60 mPa·s to 320,000 Pa·s. 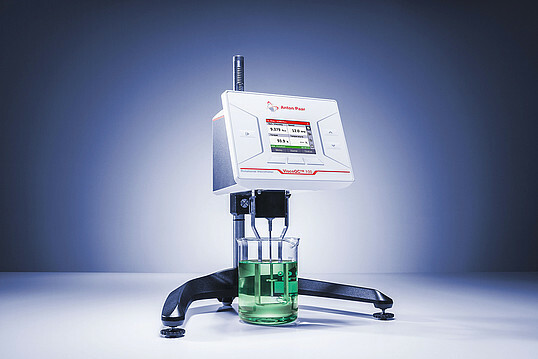 The cornerstone for a precise, dynamic viscosity measurement is a correctly positioned measuring instrument. The most common aid is a built-in mini spirit level used to adjust the meter. With the stylish ViscoQCTM 100, a digital scale in a 3.5" color display provides information about the position. "Additionally, the system monitors the alignment in operation," says product specialist Kurzmann. Once adjusted, various spindles are available for all conceivable measurement requirements. Anton Paar is offering four measuring spindles for the most sensitive L-version and seven for the R- and H-versions. Furthermore, the company offers four distinctive DIN systems, including concentric cylinders and a double-gap measuring system for particularly low-viscosity samples such as juices, whose mouthfeel is controlled by manufacturers via viscosity. All measuring parts are made of AISI 316L stainless steel, which is even more resistant than the often used AISI 302 steel. Spindle mounting is straightforward thanks to a magnetic coupling and the "ToolmasterTM system". There is nothing to screw on the Anton Paar device. The spindle is magnetically coupled, and the device detects which spindle is present via an integrated chip. If a spindle guard bar is mounted, it is automatically identified by the "TruGuard" function and taken into account during measurement. "We have put special emphasis on a user-friendly operation. The ViscoQCTM 100 offers predefined measurement methods, including our TruMode, which automatically sets the ideal rotation speed for each sample to achieve an optimum torque for the most precise and reproducible measurement," explains product manager Patricia Gejer. If necessary, the unit suggests a better spindle. 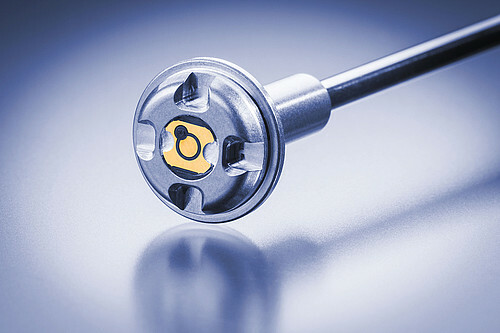 If temperature control is required, a Pt100 sensor can be connected to the device, which can also be combined with a water bath for targeted temperature control. A flexible measuring cup holder allows the use of various sample containers in pint, half a pint, quart and 600 mL Griffin formats. To prevent data manipulation, the ViscoQCTM 100 itself does not store any measurement values. These must be typed or transferred to a printer or PC. 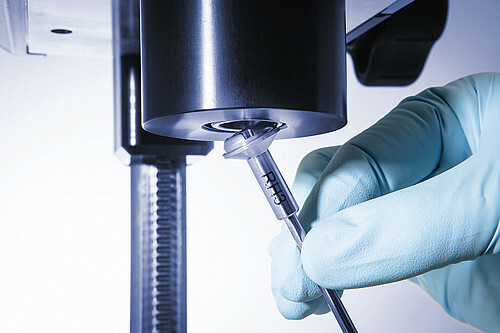 With the "Pharma Qualification Package Smart" from Anton Paar, Anton Paar specialists qualify the measuring instrument on site according to the current pharmaceutical guidelines (excluding 21 CFR Part 11) and the instrument is ready for use in just one day; or out of the box without pharma qualification.